Why some people place okra alongside Brussels sprouts, liver, and syrup of ipecac as one of those horrible things that traumatized them as children and that they’ve since vowed never to ingest again is puzzling. There is the slime factor, yes, but you’ve got to admit those fuzzy little green pods are pretty cute. And deep-fried to a slime-free crisp, as in this recipe from Dévi’s Suvir Saran, they’re as addictive as fries. Look for them now at Union Square Greenmarket’s Oak Grove Plantation stand. Small pods (three inches and under) are best. 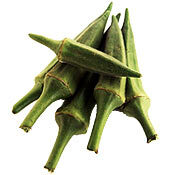 (1) Fry okra until crisp in batches small enough to not crowd the pan (about 5 to 7 minutes). Allow the oil to return to 350 between batches. (2) Remove fried okra from pan with a slotted spoon and drain on paper towels, then toss in large bowl with onion, tomato, and cilantro. (3) Squeeze lemon juice over the salad, season with salt, and toss with chaat masala.